Clemson Family means going to Texas for a conference the same day as the national championship game and having the San Antonio Clemson Club welcome a stranger with open arms, high fives, cheers and hugs as we watched the Tigers beat ’Bama. It means having Clemson Kappa Delta sisters donate money to help care for my family as my 21-month-old daughter was dying, and years later give again to support other families through Love Not Lost. It means moving to Chattanooga, Tennessee, and finding immediate friends. It means visiting my in-laws at Hartwell Lake and seeing Tiger paws and hearing “Go Tigers!” everywhere. It means love. It means support. It means unity. The Clemson Family is one of great character and pride. And I am honored to be a part of it. 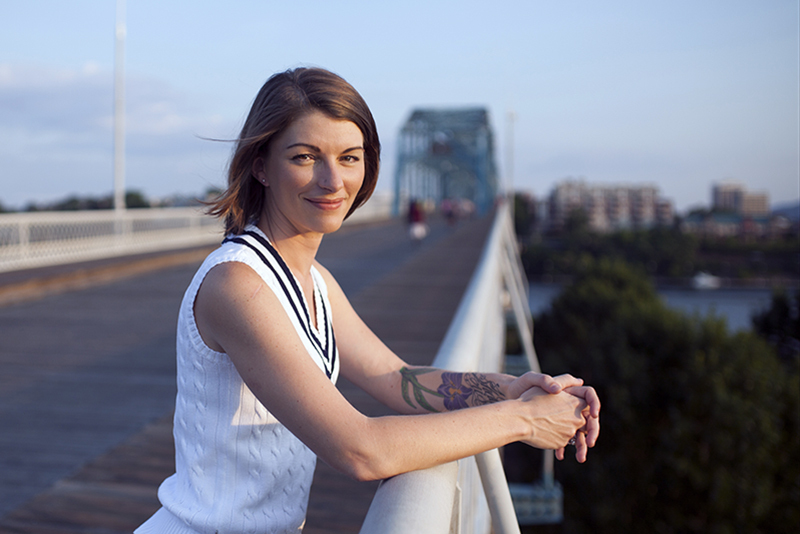 Ashley Stumpff Jones is the founder and executive director of Love Not Lost, a nonprofit that photographs families facing a terminal diagnosis to help them preserve memories. She started Love Not Lost after losing her daughter Skylar to Spinal Muscular Atrophy. We took a family trip to Italy (Rome and Florence) over Christmas Break (December 2015). This was a trip to visit our daughter at the end of her study abroad in Florence, Italy. This picture is on the rooftop of our hotel with our son who is a recent Electrical Engineering graduate of Clemson. Linda and I met at Clemson at St. Andrews Catholic Church and were thrilled when our youngest son decided to go to our alma mater. From left to right, Alex Ryan ’14, Linda Ryan ’91, Tommy Ryan’91. Jim Clements began his tenure as Clemson president at the Orange Bowl in Miami. It was clear then, as he shook hands, liberally gave out hugs and chatted with alumni, students and fans, what his personal style would be — casual, friendly and people-centered. He might be wearing a tie, but you’ll rarely see him with his suit coat. He may be running a few minutes late, but that’s usually because he’s trying to respond to one more question or comment, or hear a concern. He looks people in the eye, he asks their names. He listens. And he quotes his mother. You have to trust a man who quotes his mother. Not to say that he isn’t intense or focused. But he’s listening as he begins his time here. Ten p.m. to midnight, you’ll usually find him on his computer, trying to keep up with the hundreds of emails that occupy the box of president@clemson.edu. “I’m running a few hundred behind right now, but I will get to them all,” he says. We recently had the opportunity to sit down with President Clements and ask a few questions. CW: SO NOW THAT YOU’VE BEEN HERE A FEW MONTHS, WHAT ARE YOUR FIRST IMPRESSIONS OF CLEMSON? WERE THERE ANY SURPRISES? JC: It’s a great place made up of incredible people and a beautiful campus, with a top-notch, high-quality education. Those weren’t surprises; that’s what we expected. That’s the reputation Clemson has. And the family piece is special. For me, family is everything. We fit the Clemson Family, and we’re thrilled about the environment that is very family-oriented. We’re getting settled in, and we are thrilled to be here. CW: YOU HAVE A BACKGROUND IN COMPUTER SCIENCE AND OPERATIONS ANALYSIS. HOW HAS THAT PREPARED YOU FOR BEING A COLLEGE PRESIDENT? JC: Computer science classes, operations analysis classes and engineering classes teach you how to think. And in this role you have to spend a lot of time analyzing situations, thinking about how you’re going to proceed, making decisions. It’s helped me. This is a technology-driven world, so for me to be on Twitter and to have students following me, all that stuff helps. CW: ARE THERE ADVANTAGES OR DISADVANTAGES OF COMING FROM A HIGH-TECH BACKGROUND? JC: I think there are wonderful leaders with all types of different backgrounds. When I was a kid, I could play football all day and be as happy as can be. Or I could sit around and do math problems all day and be equally happy. The technology has helped me in my role, and the project management has helped me to get projects done on time and on budget and to think about things strategically. CW: WHAT’S YOUR PHILOSOPHY OF LEADERSHIP? JC: As a leader I try to surround myself with the best people I can — people who I can look into their eyes, know that they are good people, know that they can collaborate, know that they’re here to make a difference. It’s not about us, it’s about what we can do for others, so I try to surround myself with great people and get them to think big. In life we have a chance to make a difference. I want people who want to make a difference. One of the things that good leaders do is to surround themselves with people who are better, faster, smarter, stronger. You want to build an all-star team. We have the opportunity here to hire a couple of new people, and we will try to get the best people we can. We already have great people here, but any opportunity when we hire, we will hire great people. CW: HOW DO YOU BALANCE THE DEMANDS ON YOU AS PRESIDENT, PROFESSOR, FATHER, HUSBAND, COMMUNITY MEMBER? JC: Honestly, it’s not easy. In these kinds of roles, if you’re really in it to make a difference, and you really give it your all, you give a lot of yourself. I really don’t get a chance to go to the movies, and I don’t have time to watch TV. It’s always the University and family. That’s how I try to do it. I’m blessed to have a great wife, and I have great kids. They understand my role. I’ve been in these kinds of roles for a long time, and they understand the time that it takes. I try to balance the best I can, but honestly, it’s not easy because there are a lot of evening and weekend events. I try to get to all of the kids’ things when I can, and they’re great kids, and it’s all worked out. Beth plays a critical role in that, and she deserves a lot of credit. CW: AND ONE OF YOUR DAUGHTERS IS NOW A CLEMSON TIGER, CORRECT? JC: Yes. We have four kids. Tyler is 21, and he’s at West Virginia. We have identical twin girls, Hannah and Maggie. Hannah and Maggie were in the honors program at WVU; Hannah transferred here and is studying special education. Maggie stayed back in West Virginia because she has a horse, a dog and a boyfriend, and really likes it there. She is studying elementary education. Then our youngest daughter, Grace, is here. Grace is 13 and has special needs. She, we hope one day, will be in the ClemsonLIFE program. Grace is a very social person and loves to play sports, especially basketball. CW: WHERE WOULD YOU LIKE TO SEE CLEMSON IN FIVE YEARS? IN 10 YEARS? JC: One of the things my mother taught me when I was a kid that I really appreciate — and she taught me a lot of important things — was to be a good listener. She said, “God gave you two ears and one mouth, so listen.” So I’m really trying to listen to what others think. I don’t have all the answers yet, but I’m spending time listening to faculty, staff and students, people on the campus and in the community. So it’s more what we view Clemson as being in five to 10 years than it is what I view Clemson as being in five to 10 years. I will say this: We’re on a great path. It’s a great University with a great national reputation, high-quality academics, low student-faculty ratios, and those are things we need to continue to push. We need to enhance our research profile. We need to hire some more good people and keep things moving, but I hope to learn a lot over the next days and weeks about where we go together. We have a great 2020 strategic plan, but it’s probably time to revisit that and make sure it still lines up with where we want to go. But again, it won’t be Jim’s strategic plan; it will be our strategic plan. CW: THERE ARE A LOT OF PEOPLE WHO THINK THAT THE GROWTH IN ONLINE EDUCATION MEANS THAT IT WILL REPLACE PLACE-BASED EDUCATION IN THE FUTURE. WHAT DO YOU THINK IS THE FUTURE OF THE CAMPUS? JC: It’s a great question, and nationally it’s a question that we’re all discussing in higher education.The ability for technology to enhance the educational process is clearly there; the technology is now probably where it needs to be. It’s being integrated into a lot of the curriculum, and it will be interesting to see where it goes. What we have to do is be a part of the discussion and not sit on the sidelines. We’re doing some really good things related to online education. But I don’t think the place-based educational format is going to go away. It’s just how you infuse technology and supplement what we’re already doing. So it’s not really an either/or: We’ll have place-based education, we’ll have technology-based education, and we’ll have integration of the two. And that’s what’s going to be exciting. The ability to reach more people with technology is important. So for access, affordability and outreach, technology becomes an important tool. Higher education has changed for decades and decades, and this is just the current stage that we’re in. But it will transform education in some ways. CW: WHAT WOULD YOU IDENTIFY AS CLEMSON’S BIGGEST STRENGTH AS WELL AS OUR BIGGEST WEAKNESS AT THIS POINT? JC: Great organizations are built on great people. This is a great University because we have great people; that’s the bottom line. Our greatest strength is based on the human capital that we have here. And what I have seen in my three months, we have really good people. They care, they want to make a difference, they are doing their best. They are overworked based on our level of resources, but they are making a difference. What are our weaknesses? The one thing that jumps out at me is our facilities. We’ve got to improve our facilities. A third of our student housing is 25 years old, 25 percent of our student housing is 50 years old. We need some new facilities. We need new academic facilities. We need some new research facilities. We need some new athletic facilities. So there’s where we have an opportunity to improve. CW: DO YOU SEE THE TOP-20 AS A CONTINUING GOAL FOR US? AND WHAT DO WE NEED TO DO TO ACHIEVE THAT? JC: The top 20 is still a goal. It’s been a great goal. And I’ve tracked Clemson’s progress over a decade and a half over other institutions. We’ve made incredible steps forward to the top 20. We are currently sitting at number 21, tied with some great institutions. The top 20 are great universities. So yes, we are going to keep pushing, but that doesn’t mean at the expense of other things. We still need to push research. We still need to push facilities. We still need to do other things, but that will still be a goal. Getting there is not going to be easy, right? Moving from 38 where we were before, to 21 — not easy. It’s trying to figure the steps to move forward. And again, that’s a collaborative discussion that will be taking place on the campus. CW: WHAT WOULD YOU LIKE CLEMSON ALUMNI TO KNOW ABOUT YOU? JC: I always want people to know me first as a person. So I always talk about my family. I always talk about my background. I always like to mention that I was a first-generation college student. I think it is important for people to know that my grandparents had a fourth-grade, a sixth-grade, an eighth-grade, and we think one had a twelfth-grade education, but we don’t have any real proof of that. One of my grandfathers was a coal miner and the other one was a firefighter. What they tried to instill in me was hard work. Follow through on your word, be ethical, give it your all. But they also tried to instill in me, my two older sisters and older brother that education is the key. If you want a better life, here is your path. My parents didn’t go to college. They didn’t have that opportunity. My grandparents didn’t have that opportunity. So for me, I got in the business of higher ed to make a difference, ultimately, as a professor. When I was in second grade, my teacher used to call me “professor,” and, by the way, I always say that’s the best job in the world. It’s better than being a university president. Being a professor is what I love. I love to teach. I love to do research. I love to work with students. But, I just wanted to make a difference. Somehow I got into a leadership role. But one day I’ll go back to the classroom and teach and do research. Between my two older sisters, older brother and me, we have 11 college degrees: four undergraduate degrees, five master’s, two Ph.Ds. My brother and I finished our Ph.Ds side by side on stage, which was one of the happiest days of my parents’ lives. This has given me the opportunity for a better life. Let me help others have that same opportunity. Education is good for the individual but also for society. We want an educated society. That’s why I got into higher ed — I just wanted to make a difference. I want people to know me as me, and then I want them to know about my family, my wife, who will be a great asset to the University and the community, and our four great kids. Those are things, I think from the personal side, that are important for people to know. I am thrilled to be named the 15th president of Clemson University. I want to thank the Board of Trustees and the search committee for this incredible opportunity and for believing in me and my family. It is obvious that the board really loves this University and cares very deeply about it. Their love and passion for Clemson are contagious. One of the things that excited us so much about Clemson is that this is a family-oriented place, and the phrase “Clemson Family” means something very special. As one of the greatest public land-grant research universities in the country, Clemson has a wonderful history and a bright future. It is highly respected for being a student-centered campus that provides a top-notch, high-quality education while producing world-class research and vital services to the community. The Clemson Family is not something new to me. Beth’s family lives near the University, and her two brothers and a sister-in-law are graduates of Clemson. For more than two decades, I have seen how passionate they are about this place — and how thankful they are for the great education they received here. Our youngest daughter, Grace, has special needs, and as she enters the next phase of her life, we believe that having her extended family close to her is something that will be very important. I am humbled to walk in the footsteps of so many great presidents who have served at the University. I have been a big fan of President Jim Barker for a long time. He is highly respected across the country for his leadership, and he is also lucky to have a wonderful partner in First Lady Marcia Barker. I can promise you that Beth and I will rely on the Barkers’ advice and guidance in the years to come. Clemson truly is a gem in higher education. I look forward to working with our elected officials and business leaders to promote economic and workforce development. I believe that working together — as one team — is the only way we can succeed. When I was a kid my mother always told me to be a good person and to make a difference. I promise you that I will do my very best — working with you — to fulfill the vision set forth by Thomas Green Clemson. This spring, Clemson World sat down with President James Barker to get his perspective as he prepares to step down from the presidency and back into the classroom. CW: What was your first priority as Clemson’s president? BARKER: The way I always respond to that question is the same, and that is, my first priority is our students. But that’s a set of people and really the reason for our existence, and it’s a reminder to all of us on the campus what role our students really play. If I think back to that moment, there were two things. We needed some stability here. I had lived through five presidents in 15 years, and each of those changes was so disruptive that it was hard to have any momentum built, because you were constantly changing the strategic plans. So I reasoned that if I would commit to stay at least 10 years, then that would be a symbol about stability. The other was that some fractures were starting to get a little bit wider, and I was concerned about keeping the Clemson Family united and unified. So the idea of One Clemson emerged early on. And nobody is as strong as Clemson when we are united. CW: In your inauguration speech you noted that Clemson is “a living organism with a core and surface,” the core having a covenant with tradition and the surface having a covenant with change. How have you balanced tradition and change in your leadership? BARKER: This place has a special genius, a collective genius, about understanding that balance. Otherwise, we could not have experienced the degree of change that we did in the ’50s and ’60s when we went from an all-male and all-white military school, to the Clemson you see today, with students from 90 different countries, with 50 percent women. That would have torn many schools apart, and that did not happen to Clemson. In that quote, I was really challenging each of us to engage in that change-versus-tradition discussion — let it not be an abstract idea, but a very real idea on how we solve problems, how we build strategic plans, how we deal with the future. That dialogue about change and traditions served us very well. You can go back to the ultimate source of tradition, which is Thomas Green Clemson’s will, and he doesn’t make it very clear about how this is to be done. He saw it as a dynamic thing; he understood the need for change. You can’t say in the 19th century what the 21st century’s going to be, or in the 21st century what the 23rd century Clemson should look like. We take seriously our roots as an ag school and an engineering mechanical school. But that doesn’t stop us from working with BMW, and that doesn’t stop us from doing wind energy. What will it take to bring prosperity to South Carolina in whatever century we’re in — that’s our charge from Thomas Green Clemson. CW: You didn’t begin your presidency timidly. The top 20 goal was a bold reach. What motivated you to choose that? And yes, I gulped a few times before I said that, because I knew we had been in the third tier a year or two before. And we’re not there yet. But five consecutive years in the top 25 is clearly a trend, a level of success that I think we can be proud of. CW: You also noted in your inauguration speech that “Clemson is still a work in progress.” What are the biggest changes you’ve seen in your 14 years? BARKER: It’s hard not to start with technology. The kind of impact that instant communication has had — much for the better I think. I would list the range and location of where we are attracting students now — truly a national base, and an international base. Paths are as well worn in parts of China for students following their colleagues as they are in Bamberg and up and down the East Coast and in California and all the Midwest. The other thing that’s changed dramatically for the better is our self-concept. To a person, we believe that we are a great school. Now some would say we are on our path to being a great school, and I wouldn’t argue with that either. There are still many things we want to accomplish, but our expectations are that we’re going to be great. That’s emboldened us to dream bigger dreams and to try harder things. I’m proud of all three of those things, but I think the change in self-concept is fundamental to the success of what our university can be. CW: What was your biggest challenge? BARKER: We’ve never really had the financial base to be able to justify our dreams. At the start of my service, we were 40 percent funded by the state, and now we’re about 9 percent funded by the state. When I was a student, it was about 80 percent. But the biggest challenge, I think, was the Great Recession, when we all were furloughed — all of us took a pay cut — and yet we came through without any layoffs. We kept the Clemson Family as united as can be in a crisis like that. Coming out of that now, we’re stronger than we ever were. Certainly our capital campaign has shown that — we’re approaching $700 million, and we’re dead serious about reaching that $1 billion goal. When we do, we’ll be the only school our size ever to have done that, and I think that shows a lot about self-confidence and self-concept. CW: You’ve often begun speeches with stories of life in the president’s house. What’s one of your favorites from over the years? That engagement is something I treasure probably more than anything else about living on campus or this work. That students would think to invite the president to play Frisbee — there is just something right about that. And I guess that gave me the confidence, that maybe I ought to get in the Tiger suit and do push-ups, and who knows, water-ski behind the rowing team. That degree of engagement always seemed to me to be the most joyful part of the job, but an important part of the job too. CW: How has your background in architecture enriched your presidency? BARKER: I can’t imagine a better preparation, a better education for a university president than architecture. I never thought of it this way, but at some point about six months into this service, it dawned on me that I’m practicing architecture. My education was very broad — all the way from poetry to plumbing — but it wasn’t very deep. And that’s what a president’s job is. You don’t have to be an expert in everything on campus, but you need to have some understanding. The liability is that I don’t have the depth in any one area, but as president, that could get in your way. I really value that education because of the breadth that it gave me. It also asked for me to use both sides of my brain, the left brain and the right brain. So you’ve taken physics and you’re also taking painting. The other part is that I am conditioned to strive for the beautiful. My eyes and my brain are very much tuned to things that aren’t, and they stand out when you’ve had that kind of education. I really value the beauty of this campus and making sure that it continues to become even more beautiful with every decision we make. It’s not just an aesthetic game I’m playing; we attract students and faculty to this campus because they look around and say, “This is beautiful — I want to live here.” It makes me look forward to getting up and coming to work every morning because I’m surrounded by this kind of beauty. We have to make sure that we continue to do that in both the design of our buildings, and in the spaces between the buildings, the outdoor rooms. We ought to strive for this place to be a garden — every inch of it to be a garden — and I think we’re making real progress there. I get to live here, and enjoy it when it’s filled with people and enjoy it when it very quiet and the mist is coming off of the lake. It’s a spectacular piece of the earth. CW: When you look back, what were your proudest moments, both personally and professionally? BARKER: Let me touch on a few of the highlights. I think that each one was a success that I didn’t do, that the campus did — everybody was a part of this. These things are too complex for one person to do. But I would list among them the fact that we set out to get a Phi Beta Kappa chapter, and now students are leaving Clemson with that very important credential, and it’s changed our self-concept. The fact that we enrolled and created the National Scholars Program in 2000 — I would list that as a major moment. The fact that we raised tuition 42 percent in one year and kept this family together. People rallied to support it because they believed in the quality of a Clemson education. We were one of the lowest priced, in terms of tuition, statewide, and we should have been priced according to the value we were giving. We built that base, and heaven knows — that was before the Great Recession — where would we be if we hadn’t done that? The quality wouldn’t be there. The partnerships we’ve enjoyed with BMW, with Michelin, with the City of Greenville and with the state that created ICAR. It was a matter of really good teamwork and really good timing, and it’s helped give South Carolina a direct look at what a knowledge-based economy looks like. The way we got through the Great Recession, with no layoffs, and we kept ourselves together. The fact that, at the start of the Will to Lead capital campaign, we could have delayed that announcement, because you don’t do that kind of fundraising in the worst recession in 60 or 80 years. The Board said continue, the Foundation Board said continue, and we did. And that’s why we are where we are now. Winning both a National Championship in Golf and the Habitat for Humanity International College Chapter of the Year. That shows the true balance of Clemson. The Department of Energy grant we got to develop the drivetrain test facility in North Charleston, which is nearing completion now. That $45 million, combined with the state match, produced a $100 million project that we were able to capitalize on to create an environment that will help industry and serve our students remarkably well. Creating the Academic Success Center, and Dori Helms, our provost, deserves credit for that. It was her idea and now we see the physical manifestation of a very good idea in a brand new building on campus. I was touched by the Ring Ceremony, and having Col. Ben Skardon, one of my teachers, talk about what his ring had meant to him on the Bataan Death March and his prisoner-of-war experience for almost four years in the second World War. And one that was hard, was the brawl we had with the University of South Carolina in football in 2004. We decided that we weren’t going to go to a bowl game. That was behavior we couldn’t accept, and we were not going to reward ourselves by having a bowl experience. I think that sent a pretty clear message about where our priorities were and a little bit of a statement about Clemson’s integrity. It was not universally praised, but I think it was the right thing to do. CW: How has being an alumnus affected your presidency? BARKER: Clemson is not ordinary; it is not normal. It is a school with all sorts of idiosyncrasies. We just don’t behave like other schools behave, and we don’t put priorities on things that some people, at other schools, might put priorities on. But the things we do put priorities on are critically important to us. It has taken me a lifetime to figure those things out. I started at Clemson as a 17-year-old, the oldest of three boys, in a family that never had anyone go to college. My father died a year before the first time I walked across Bowman Field. I’ve just found that knowing that history, those traditions, how a campus can embrace someone — that’s where our priorities ought to be, and I understood that almost instinctively. I would have been a lousy president somewhere else because I didn’t understand those things. I think that understanding those distinctive qualities, praising them, strengthening them, has been an important part of what I hope we’ve accomplished. CW: Is there anything you would characterize as “unfinished business” as you retire? BARKER: The enterprise legislation. I knew it was a very hard task to get that through in one year and even more so in an abbreviated year. But that’s unfinished. It must happen — it is vital to our future. But we’re halfway there, and we’ll be planning our efforts between now and when the legislature begins in January. And we’ll be very active in this offseason to plant the right seeds hopefully so that we can be successful. CW: What will you miss as you return to the classroom? BARKER: No more knocks on the front door and to see who’s there — to open that door and to see what kind of Clemson experience someone is having, and whether or not I can make that better. I will miss that. I’ll miss the interaction with students and with faculty and staff too, but that interaction with students. That’s one thing we’ll miss, living right here in the middle of campus, surrounded by that energy, or that depression after the first round of tests. You can feel it by just being a part of this campus. So being an integral part of the campus 24 hours a day, seven days a week, is something I think we’ll miss. CW: Is there a place on campus that has been particularly significant for you, either as a student, faculty member, or as president? BARKER: There are moments when you walk on this campus that you get these glimpses of the mountains. There are a couple of beautiful spots where that happens on the campus; one of them is at the base of Tillman Hall. You look down College Avenue, and you see those mountains looming in the distance. I never get tired of that view. It’s breathtaking. And Bowman Field, because every time I walk across it, I have that memory of the first time I walked across it, and the sense that this campus gave me, just intuitively, that said, “You’re going to be okay. We know you’ve got lots of challenges, financial, you lost your dad, you’re sort of representing your whole family in this effort. Trust us, you’ll be okay.” I felt that very much that first time, and now when I walk across Bowman Field, I feel the same way, every single time. CW: Is there a person who was particularly significant for you as a student? BARKER: Ben Skardon. This Marine reading poetry in his big deep gravelly voice and reading Shelley and Keats — I was just mesmerized by that. Two faculty members in architecture who realized that I was having a financial crisis. They found a scholarship that fit my grade point average and need, and that kept me from having to drop out of school. And then there was this speech teacher who had us listen to the speeches of Martin Luther King back in 1966 or ’67. She never talked about the content. She would say, “Listen to the inflection here. You know I’ve been teaching you about how repetition works when you’re giving speeches, and inflection and volume.” I was a changed person coming out of that class. I was not the same person walking out of there that I was when I walked in. It wasn’t just about technique and speech either. CW: It’s obvious that you and Mrs. Barker have approached this presidency as a partnership. How has that enriched and strengthened your presidency? BARKER: That’s absolutely true. The grace that she’s shown and the hospitality that she’s shown — I think it’s in her DNA. But also the kind of preparation that I had for the job — she had the same. Consider this — our first year of married life was in married student housing here. So she had that same understanding about Clemson that I had and was an active part of the community. From her preschool days [as a teacher and director at Fort Hill Church], she has a lot of alumni in this town, and now they’re my alumni. So we’ve handed off four-year-olds who became Clemson graduates, and that’s really a joy to see. When she sees them walking across the stage getting their degree, it’s a special moment for her too. I don’t have any doubt that the best first lady that Clemson’s ever had is Marcia. CW: Any other thoughts you’d like to share with us? BARKER: I think the thing that I’m feeling right now, as the time for us to change majors comes, is an overwhelming sense of gratitude. I am overcome by moments that are so special to me that demonstrate the opportunity that we’ve been given, and the gratitude that I feel for that opportunity to serve my alma mater for 14 years, to be the spokesperson for the Clemson Family, in times of loss, in times of celebration, all the way to memorial services for students, to picking up the trophy from the ACC Championship on the field and everything in between. I just have an overwhelming sense of gratitude. CW: I would say the University probably has the same sense towards you. BARKER: I don’t know about that part, but I just know what’s rolling around in my head and my heart, and it’s powerful. Fourteen years ago, James Barker approached the podium for his inaugural address. Unlike many new presidents, he already had a fairly comprehensive understanding of the institution. After all, “president” was just the most recent of his Clemson monikers. Student, alumnus, faculty member, dean, parent — he had already experienced the University from all of those perspectives. In my humble opinion, James Barker and R.C. Edwards were the best presidents to have served Clemson in any time or season, but especially this was the case when it came to their steadfast leadership surrounding issues of race relations. Dr. Edwards’ leadership during Harvey Gantt’s 1963 enrollment is well documented and widely known. What many may not know, however, is the quiet, dignified and determined way that President Barker built on President Edwards’ legacy to garner Clemson the coveted reputation as one of the nation’s premier institutions for tackling very complex and vexing issues surrounding diversity in higher education. • The visionary Call Me MISTER program: No one really knew what to do about the chronic black male teacher crisis until this program unfolded. It is the national model. • The National Best Practices Conference in the Achievement of Students of Color: Poor retention of all students had been one of higher education’s ugly secrets for many years. This challenge was most acute among black students. After more than a decade, this annual gathering has become the gold standard for identifying solutions to this persistent problem. President Barker has participated in every minute of every session. He thus created an indelible impression about Clemson on the minds of the thousands of leaders from across the nation. • Black faculty recruitment: With the appointment of Dr. Juan Gilbert as chair of Human-Centered Computing and later as the first Presidential Endowed Chair, President Barker has done what many in higher education, industry and government thought to be impossible. Recruiting and retaining black faculty is intensely competitive in all disciplines, but especially in science, technology and mathematics. In short order, Clemson now has the largest concentration of black computer science faculty and Ph.D students in the nation. This could not have happened without President Barker’s leadership. These accomplishments have truly been game changers in terms of how Clemson is perceived across the nation and around the world. President Barker’s singular ability to do the right thing while institutionalizing positive outcomes will hold Clemson in good stead for decades to come. For me, the National Scholars Program symbolizes Clemson’s extraordinary academic and intellectual growth during Jim Barker’s presidency. To create the program called for extraordinary vision and for enormous faith in Clemson’s students, staff and faculty. To sustain it required a continuing commitment to providing the resources necessary to recruit, educate and challenge some of our very best students. Finally, to establish the program as a vital and integral part of Clemson’s culture required President and Mrs. Barker’s personal involvement and support. Jim and Marcia have been at nearly every important National Scholars event. They have entertained every group of National Scholars freshmen at their home. And they have made it clear to everyone at Clemson that the National Scholars Program — and the Calhoun Honors College as well — are both key symbols and very real products of Clemson’s commitment to academic excellence. I believe that President Barker’s commitment to elevate the academic standards of Clemson, to lead with transparency and to be accessible to the entire Clemson family, especially to students, is second to none. Although I did not attend Clemson, I have worked here for 41 years, and it has been so rewarding during President Barker’s tenure to watch the University develop from an excellent regional university to one that is highly ranked nationally and well-respected. All Clemson alumni, and past and present faculty and staff, are proud that a degree from Clemson means much more now than in the past. In addition to being a masterful architect of so many academic innovations and accomplishments, President Barker’s handprint is obvious in the improvements on the facility and the landscaping that have occurred during his tenure as president. I will always be grateful to President Barker for the wonderful support that he has given the arts programs at Clemson, for no university can be considered great without having a strong program in the arts. He and Clemson’s gracious first lady attended performances at the Brooks Center as often as their schedules would allow. President and Mrs. Barker leave huge shoes to fill. Fourteen years ago, Jim Barker set out to build a better university. He had a vision that Clemson could be a nationally recognized public institution. The fact that President Barker’s lofty vision for Clemson has been realized is certainly commendable by itself. But the most compelling part of the story is not about the obvious success President Barker has achieved, but rather how he went about achieving it. He met the challenge posed by St. Augustine to the faithful so many centuries ago — he stayed grounded in humility — built a foundation on it — even as Clemson soared. History is replete with examples of powerful leaders who are larger than life, whose force of personality makes them irresistible to watch; leaders who are at their best and most dynamic when the spotlight shines the brightest on them. Few of us equate power, much less success, to those who turn the spotlight away from themselves. And yet, that is exactly how President Barker has achieved such remarkable success as one of the longest-serving college presidents in the U.S. He is always ready to lead and always reluctant to take credit. His humility encouraged and enabled other talented people to work on Clemson’s behalf — all headed in the same direction, all following his lead. He and Marcia were always exceedingly gracious, greeting students, parents and staff as warmly as they did visiting dignitaries and VIPs. They represented Clemson globally and championed the University in prestigious venues. But he and Marcia were just as content — probably more so — opening their home at night to students who simply needed some support. He was comfortable walking the campus and cheering at games. He wanted Clemson to succeed on his watch, not because of his own personal investment or aggrandizement, but because when he went off to college as a young man, he went to Clemson. He wanted to give back better than he had received. Today the University stands taller than ever, nationally recognized for its academics and athletics. It’s in the top tier of public schools — just as Jim Barker envisioned more than a dozen years ago when he began building a lasting foundation. For Barker, it was always about Clemson rising tall, about generations of students crediting CU for providing a springboard to countless opportunities. It was never about his own legacy. Yet, history will undoubtedly record President Jim Barker’s rich contributions to Clemson, accolades the man himself is too humble to accept. I have been privileged in my teaching career at Clemson University to have had James F. Barker as a student in my classes for three of his early semesters (one B, two A’s). Few people have known that Jim Barker came to Clemson on a partial athletic scholarship. He was a pole-vaulter from Kingsport, Tennessee. Like his reticence to talk about his ability to draw, he seemed less inclined to review his brief career as a vaulter. During his early years as a student in the school of architecture, he had an assignment, possibly in design or to test his creative inclinations. He visited my office and asked if I would take a look at his project. To me, Jim always had been a serious student. Naturally, I was flattered by his request. He unveiled plans and drawings for a city to be constructed in the area where South Carolina, Georgia and North Carolina boundaries are contiguous. The overall concept was a layout of a series of concentric circles, in which each circle some function or activity — habitation, religion, education, civic government, business, medical, etc., would be planned. I was amazed at his vision. Jim Barker’s vision has carried over to the planning and development of the Clemson University campus, which now impresses students, visitors and local residents. I have always taken pride in and have admiration for my former student from Kingsport, Tennessee. As I reflect on the presidency of Jim Barker, I am so very proud of the accomplishments that Clemson has achieved over the course of Jim’s administration. Under Jim’s leadership, Clemson has risen to become a top-25 public university. Jim aspires to see Clemson improve because he wants to see Clemson students have an opportunity to receive the best education possible. Jim Barker is a man of integrity. He is a great visionary and great strategic planner. He leads with a core passion to put the students and their success first. Most importantly, this “down to earth” man loves Clemson University! Marcia Barker has been an incredible leader as well and a fantastic ambassador for Clemson. She leads with a very special style and grace, and she has made Clemson a much better university. Clemson has been blessed by the Barkers! I have always admired Jim Barker as the essence of a true Clemson man. He proved my long-held belief that architects, because of their unique education and training, could go out into the world and do much more than design buildings. Jim and I have often reminisced on a speech I gave at the College of Architecture years ago. I spoke on the theme of how some of us student architects could one day leave Clemson to serve as leaders in society … because we were being trained to analyze problems, examine alternatives, choose a way forward, and execute a solution with conviction. In other words, we were trained to be leaders, in our design firms, in civic life, in politics, in business, and even to lead a great university … like Clemson. Jim was in that audience when I spoke, and says he was inspired. Wow!!! And he has gone on to build a great record as one of Clemson’s finest presidents and a great leader in education for South Carolina. Jim Barker is well-known for his intense interest and caring spirit for the well-being of Clemson students. What is not so well-known is his unique ability to manifest that same level of interest for campus organizations that are not an integral part of the University’s core mission of teaching and research. I witnessed this during the past two years as IPTAY went through a reorganization. Early in the process we sought guidance from President Barker. He maintained a high level of interest in IPTAY , and never failed to avail himself to us. As the IPTAY Board moved through our changes, we recognized that the new landscape of college athletics suggested more involvement of college presidents. President Barker was aware of this new trend, and embraced our idea to have him become an active member of the IPTAY Board. Jim Barker is one of the finest individuals I know, and I’m incredibly appreciative of what he’s meant to me both personally and professionally during my time as ACC commissioner. As I look back over his tenure as president of Clemson University, it’s important to note that his fingerprints are all over the many monumental milestones that have happened within the ACC . From the league’s expansion in 2003, through the latest expansions and the grant of media rights, Jim has been instrumental in strategically positioning the Atlantic Coast Conference for the long term. There’s no question that Jim is one of the most well-respected presidents, not only in the ACC but also across the NCAA landscape. As an educator and leader, he is insightful, thoughtful and brings tremendous wisdom. Jim has become one of my most trusted advisers, and I’m thankful for the friendship we’ve developed over the years. I wish Jim, Marcia and the entire Barker family nothing but health and happiness in the years ahead. I first met my architecture classmate, the future president James F. Barker, on Riggs Field in August of 1965. Riggs served as the track at that time, and Jim was practicing his event, the pole vault. My first Clemson roommate was the other freshman vaulter, and he was excited to introduce me to his teammate since, he surmised, we had so much in common as architecture majors. Little did he know that this thoughtful introduction would lead to a lifetime of collegiality marked by true friendship. From my perspective, the most significant contribution made by Jim Barker during my tenure as vice president for research and economic development was to articulate the “Top Twenty” Vision, and hold us accountable for it. The vision was compelling, succinct, memorable and measurable. It galvanized our thinking about Clemson University as a distinctive, national research university, guided our strategic planning and drove our implementation. The quarterly “Report Card” measured our progress. For me, the second most important concept by Jim was to challenge us to develop a “Town/Gown” relationship with the City of Greenville. These two bold ideas set in motion the deliberations and strategies which culminated in CU-ICAR and the other innovation campuses. As we worked on developing the practical implications of public/private partnerships that were aligned with the University’s core academic missions of teaching and research, and fostered economic development for South Carolina, Jim was personally engaged in these discussions. As the physical campus of CU-ICAR was designed and built, he brought his architectural background to the design charrettes. It was a personal privilege for me to tour the CGEC with Jim, and have him give me a passionate description of the sight lines and the architectural highlights of the building. Finally, from a personal perspective, I could not have asked for a more supportive and encouraging president than Jim Barker. Recognizing the very high risks associated with such a bold idea as CU-ICAR , he consistently was the “champion” with our Board of Trustees, our state legislators and the Greenville community. I consider it a great honor and privilege to have spent the last nine years of my professional career serving under President James F. Barker. It would be easy to rhapsodize about Jim Barker’s intelligence, his dedication and his humaneness. But anyone who has been near Clemson University in the last dozen years knows about all that. So I add this comment: Throughout his presidency, Jim taught a course called “The President’s Seminar.” It met on Tuesday afternoons each spring and included about 15 students from several different disciplines. And it included six or eight faculty who, along with the president, made presentations and joined discussions. I was lucky enough to get in on it, and I count it as one of the best experiences of my 38 years at Clemson. As I look back on that seminar, I realize that, except for his Tiger Paw cuff links and ties, Jim did not appear to be president of anything. He was just a part of the general fray. Maybe he was so good with the students because he had been a Clemson student himself; maybe he was so good with the faculty because he had been on the faculty — and was still on the faculty. Whatever the cause, he was one of us, and we loved it. “One Clemson” was more than a motto to President Jim Barker. He truly wanted the academic and athletic communities to merge and achieve a unified pride in Clemson University. That’s where Solid Orange came from — speaking to our traditions and how we conduct ourselves to understand our part in making the University strong. He worked hard to create an environment of unity when so many campuses across the country experience disunity. He not only talked about supporting athletics, but as a former student-athlete, he is competitive. He and Marcia would attend many, many sporting events; they welcomed student-athletes regularly into the President’s Home, and knew most of our coaches and staff by name. You could count on seeing their Labs, Macs and Mookie, at rowing meets. In addition to an already full schedule with campus responsibilities, he chose to be involved with the NCAA at the national level. He entered his tenure with extremely high athletic goals, targeting national success especially for football and men’s basketball. We’re all proud that under President Barker’s leadership, Clemson football has returned to the Top 10, won three divisional championships and the first outright conference championship in 20 years. While men’s basketball at Clemson had historically struggled, President Barker’s support enabled our program to enjoy some unparalleled success and continuing progress — specifically, four consecutive NCAA tournament appearances, a first in Clemson history. Certainly, Clemson enjoyed success and significant progress in other sports as well, but I find it fitting that as a track letterman, his final spring as president included Brianna Rollins’ thrilling individual national championship at the NCAA Outdoor Championships and our men’s and women’s track programs again competing at the highest level. What’s refreshing about the athletic success is that it was accomplished with President Barker’s high academic expectations as well. While Clemson’s student-athlete academic performance has been strong in the past, it became measurably stronger in all sports the past decade. Jim Barker’s passion for being a president who was devoted to public service became evident within his first 100 days in office. He took teams of his administrative group on two trips across South Carolina to meet the people who love Clemson dearly but rarely get to the main campus. He continued that enthusiasm for engaging with the public throughout his time as president. He extended that commitment to public service when the University embarked on the creation of “new” enterprise campuses in locations across the state. His brand of economic development was to take the University to where the action was located. This idea has led to one of the country’s most relevant and successful university technology-based economic development strategies. Jim’s unique ability to engage with the state’s citizens has allowed Clemson University to maintain a strong sense of reality as we do our daily work. In early May 2006 a senior, Travis Rada, realized he was an hour short of graduating. Travis’ mother, Janet, was very ill with cancer, and he had lost track of his hours since he had been trying to spend as much time with his mom as possible. Travis took the course during Maymester to complete his requirements to graduate in August. But the doctors had told Janet that she probably wouldn’t be alive in August. Through all of Janet’s cancer treatments, her one goal had been to see Travis graduate from Clemson, and Patrick, her youngest son, graduate from T.L. Hanna High School, both that May. With the help of registrar Stan Smith, President Barker presented Travis with a certificate of completion on June 1, 2006. The ceremony took place in the President’s Office with Travis’ parents, brother and grandparents present, Travis in his cap and gown and President Barker in his academic regalia. Less than six weeks later, I attended the memorial service for Janet Rada. Front and center of all the pictures that were placed on the table to honor Janet’s memory was the photograph of President Barker and Travis in their academic regalia and Travis’ proud family members. 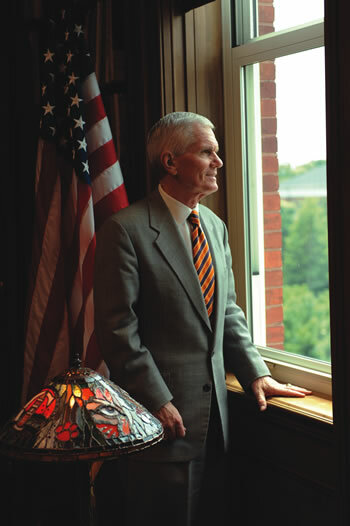 President Barker’s accomplishments at Clemson will leave a lasting impact on the future of the University. His consistent involvement with the student body has been a major factor in producing the “Clemson Experience” that is so often discussed. Students have been reflecting on their favorite memories with him, including times when he passed out lollipops at the Homecoming floats, opened his home for trick-or-treating on Halloween, allowed students to walk his dogs, did pushups as the Tiger mascot during a football game and helped with freshman move-in. President Barker’s desire to make Clemson the best it can be, while preserving the rich heritage and traditions that make the Clemson experience so unique, is remarkable. Clemson’s success in the past decade is largely due to his leadership and unwavering values He will always be remembered as one of Clemson’s most outstanding and respected presidents, and I am blessed to have had the opportunity to work with him during these last few months of his presidency. As I reflect over the past 14 years of Jim Barker’s tenure as president of Clemson University, two words, in particular, come to mind — Clemson Family. President Barker really does understand the meaning of these two words because he was reared in the family that is so proud to call him one of our own. He possesses a deep sense of caring and placing the Clemson Family and, in particular, the current Clemson students first. His unwavering resolve has helped Clemson remain a “high seminary of learning” just as Clemson’s founder, Thomas Green Clemson, so eloquently stated in his Will. We are so proud and fortunate to have been able to call Clemson’s 14th president one of our own. Jim Barker has been the only president I have known since I came to Clemson in 2003. He has set the bar very high for future presidents and has certainly brought Clemson to a higher level academically, athletically — in all areas. He is a class man who has been a joy to work with. I will be forever indebted to him for supporting my hire as head coach in 2008. He has treated me with respect in every way since I have been here. What I will remember most about Jim Barker is his genuine love for Clemson. Cappy and Sweet, you’re our favorite Tigers! Thank you for teaching us cadence count, that orange and purple are the best colors, and for letting us hitch rides at the First Friday Parades. We’ve loved our many adventures in the President’s House, like counting tigers and camping out in our tiger tent in the living room. We’re saving chairs for you at the tailgate. We love you! We would just like to thank you both for introducing us to so many friendly students over the years. You are so right when you say Clemson students are the best! We sure are going to miss our morning walks on campus with you guys. P.S. We really are SO SORRY for chasing after that skunk we found in front of the P & A Building one morning. We had no idea he would spray us and that it would take a week full of baths to get us clean! President Barker was never just a figurehead — he was an active participant in every Clemson student’s experience. Few university presidents have improved their school’s academics so remarkably, and even fewer have earned the genuine love and respect of its students. At the Clemson vs. Furman game this past year, the crowd bellowed, as usual, in coordination with the Tiger’s pushups. After a fairly long count, the Tiger unexpectedly stood up, threw off his headpiece and revealed an impassioned President Barker. Upon recognizing him, the stadium’s roar soared because we all knew that he shared our love, devotion and pride for Clemson. At my ring ceremony, President Barker showed his unyielding devotion to Clemson students once again. I had always heard that there is something sacred about a Clemson ring ceremony; after 90 hard-earned hours we would walk with our fellow classmates to receive that famous and celebrated Clemson ring. Unfortunately, we knew that President Barker had recently received emergency surgery and assumed he would not be able to present our rings. However, as he had throughout my entire Clemson experience, he proved that Clemson students were his first priority. As he presented me with my ring, he leaned over and said, “We’re proud of you,” and I, along with the rest of the students receiving their rings April 8, 2013, knew that he truly was. 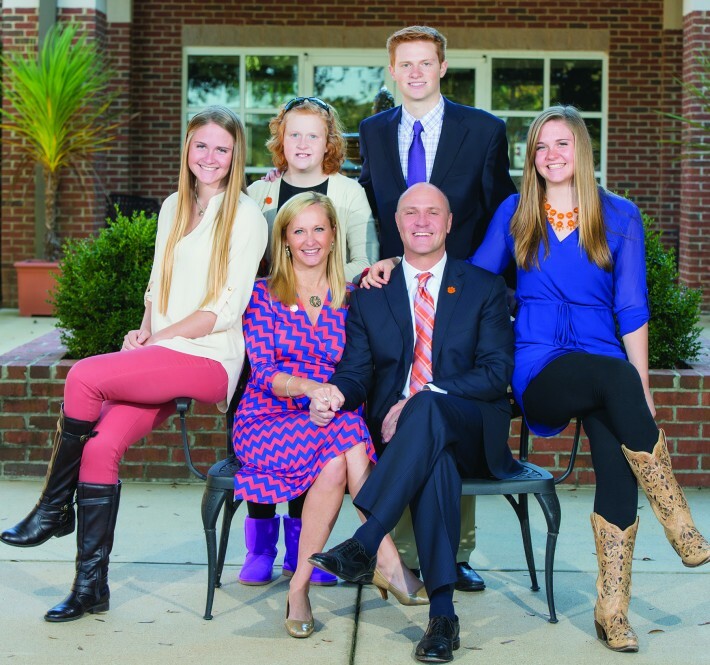 When I think of the Barkers’ tenure at Clemson, I am struck by their family approach. They always would speak at orientation programs and offer their home, their dogs and even themselves to anyone feeling a little homesick. I believe Clemson is such a happy place because you do not feel like you’re at an institution. There is a constant feel of home, no matter where your other home may be. I truly feel the Barkers were at the center of this warm, caring atmosphere. On a personal note, they arrived for move-in day for my daughter Libby, and then a couple of years later for my daughter Hannah. President Barker gave them each a signed miniature Clemson banner and told them to keep it with them till graduation for luck. Right from day one it was a personal, magnetic approach that made our whole family feel like we were home. The Barkers’ genuine love of the place was transparent and infectious, and thankfully will continue to live at Clemson. In the Barkers’ 14 years of living and entertaining here, tens of thousands of guests have crossed the threshold — each one enjoying an introduction to Marcia’s hospitality and her love of all things Clemson. Whether it’s a donor event, Woman’s Club gathering, faculty reception or alumni celebration, an invitation to the President’s Home is always an invitation to time well spent with Marcia, as she entertains alongside her high school sweetheart, life partner and best friend. The flowers are fresh, and guests are welcomed with a warm smile and open arms. And if Marcia can help it, the roses are always orange. “When we lived in Clemson as students, Jim’s architecture faculty embraced all their students,” she recalls, seated in her well-appointed front living room and explaining that, as a young couple in the late 1960s, they were invited to picnics, dinners at faculty homes and all variety of outings. Marcia and Jim met in Kingsport, Tenn. They were high school sweethearts, dating for five years before they were married in 1969, him at 21, her at 20. Her father signed for her to wed the young Clemson architecture student, and she left Winthrop College lacking one year of school so she could move to Clemson. She completed her Bachelor of Arts in elementary education at Georgia State University in 1972. Their marriage marked the beginning of a partnership that would carry them through life and academia, starting out in “married student housing” at Clemson, a modest group of buildings known as the “pre-fabs.” The small metal buildings on Jersey Lane have long since been replaced by the Brooks Center for the Performing Arts. But every time the Barkers attend a performance, Marcia says they smile a little at the memory of their Clemson beginnings. Nearly 45 years later, she’s seen more kindness extended to her family by the Clemson Family than she could ever have imagined. 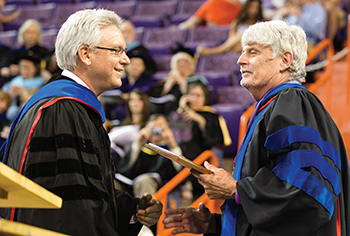 Through the years, the Barkers worked together to serve the students and faculty and to advance Jim’s career, raising two sons, Jacob and Britt, along the way. They celebrated a wedding and two grandchildren in that time — son Jacob married Rita Bolt Barker and they have since had two daughters, Madeline and Eliza. On her own, Marcia has served the community with diligence and selflessness, volunteering her time and her talents to many, many organizations — America Reads, Friends of Lee Gallery, Fort Hill Presbyterian Church, Clemson Child Development Center and University organizations among them. As first lady, she is honorary president of the Clemson University Woman’s Club, and each year she hosts their open house. As a caring friend, she can be counted on for her homemade breakfast casserole during times of loss (a death) and moments of celebration (a new baby!). She is often responsible for flowers when a special event is happening at her church. The Barkers moved into the President’s Home in 1999, and since 2000 they have hosted an impressive 93,708 guests at 789 events there. Johnson works hand in hand with Marcia’s executive assistant, Linda Wofford, to support the events and entertaining that take place at the President’s Home. Johnson and Wofford have been a team since they both worked for University dining services in the 1990s. They agree that Marcia’s cool, calm and collected public persona doesn’t change behind closed doors. What folks don’t see as often, they say, is her sense of humor. Case in point: Years ago, the Barkers were entertaining a group of college deans with an outdoor, white tablecloth dinner reception. As Johnson and Wofford were just finishing setting the tables and the Barkers were inside getting dressed, the backyard sprinklers went off. Everything was soaked. The Barkers emerged. They saw the soaked table settings. Their response? “They laughed,” Wofford recalls, smiling. The four of them worked as a team to wipe down the glassware and china and replace the soaked tablecloths. Minutes before guests walked through the door, Marcia was helping her team dry off the wet grass with bath towels. “If anybody had seen us, they would have thought we were crazy,” Johnson says. It remains one of her most treasured memories from her years at the President’s Home. There’s seldom a face that Marcia Barker forgets. Rare is the occasion that doesn’t merit a hand-written note in her perfect script. She’s in a constant state of outreach — be it congratulations or condolences. It’s not out of obligation. It is, friends say, because she really cares. “She will know as much about you as you know about her,” says Hazel Sparks, a longtime friend of Marcia’s and her former teacher’s assistant at Fort Hill Preschool. Marcia taught and served as director of the preschool for 10 years, prior to becoming first lady. Sparks, a Clemson institution in her own right, connects the dots between Marcia’s teaching days and her role as first lady. And chances are, if you had a nice conversation, she’ll write a thoughtful note to say so. There’s no telling how many notes Marcia has penned through the years. But if you ask her, it’s one too few. It’s been years since they’ve gone back and looked in the wooden box that holds the thousands of letters they’ve received through the years, dating back to when President Barker was inaugurated. In retirement, they have plans to revisit those letters and those memories, one at a time. A favorite memory Marcia shares occasionally is a valentine’s party that several male students talked them into hosting at their home. The undergrads convinced the Barkers to let them cook dinner in their kitchen and have their blindfolded dates chauffeured to the President’s Home to share the meal. The young women took turns gasping at the surprise before being invited to sit down to dinner. Afterward, the group of about eight ladies gathered in the den with Marcia, and the next thing they knew, one of the young men had slid behind the grand piano. He started playing. The rest of the men, including President Barker, then filed in through the French doors and surrounded the piano, proceeding to perform a choreographed rendition of the song, “L-O-V-E.” (Think, “L, is for the way you look tonight.”) The song ended with Jim on bended knee in front of Marcia, an orange rose in hand. It’s clear that memories like that will live on long after the last of the Barkers’ belongings are moved out of the President’s Home and into a home off campus. Marcia hasn’t spent too much time being reflective about her tenure as Clemson’s first lady, in part because she’s still so busy, but also, she says, because it makes her emotional. Ever want an easy way to find out what an old classmate is doing now? Or a quick way to send a message to the Clemson Family about your newest job, impending nuptials or move to a new location? “Tigers on the Move,” a new interactive Web portal, will allow you to do just that. A complement to the alumni news found in Clemson World magazine, this site will allow for real-time, immediate updates and searchability. 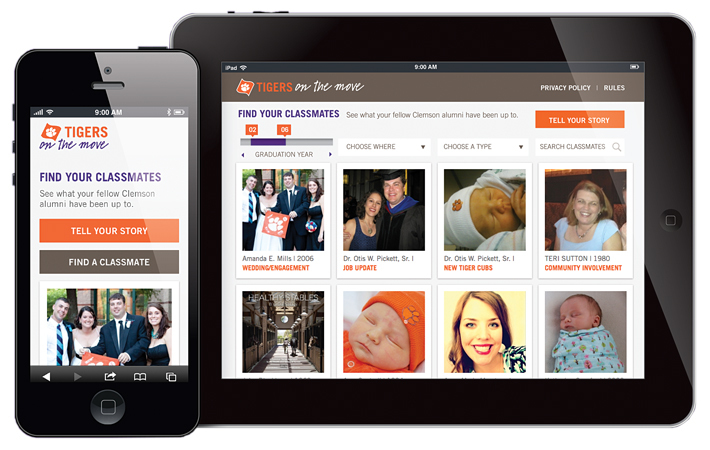 Check it out at TigersOnTheMove.com and submit your latest Tiger news today! Are you a ring-wearing Clemson alum? We have recently launched a Twitter feed and Instagram page dedicated to the Clemson Ring. Share pictures of you and your ring, indicating your class year and location by tweeting @ClemsonRing and tagging ClemsonRing on Instagram. Students have chosen Ashby B. Bodine as the 2013 Alumni Master Teacher. Bodine is professor emeritus/visiting professor in the Department of Animal and Veterinary Sciences in the College of Agriculture, Forestry and Life Sciences. Bodine’s research has been on the biochemistry and immunology of archaic vertebrates, in particular, sharks, rays and skates. Since 2006 an interdisciplinary Creative Inquiry team mentored by Bodine has been researching an anti-tumor protein from the bonnethead shark that has great potential for use in anti-cancer treatments. Bodine has received the Godley-Snell Outstanding Agricultural Research Award, the Class of ’39 Faculty Award for Excellence, the Gamma Sigma Delta Outstanding Teacher Award, the National Scholars Program Award of Distinction and the Outstanding Teacher Award from the National Association for Colleges and Teachers of Agriculture. The Alumni Master Teacher Award for outstanding undergraduate classroom instruction is presented to a faculty member nominated by the student body and selected by the Student Alumni Council. This year marked the Golden Tiger Reunion for the Class of 1963. Bobby Kemp ’63 drove the same car to reunion that he drove off campus on graduation day. The car even had its original Clemson College parking decal. See page 46 for news on the Class of 1963’s reunion gift. through 1963 gathered to reminisce and reconnect with the Clemson Family. The Clemson Alumni Association Board of Directors has elected four new members to take office July 1. Gary E. Clary ’70 of Central, a retired circuit judge and certified mediator and arbitrator, will serve a two-year term. An IPTAY representative emeritus, he has served as a member of the Alumni Association National Council and is a past president of the Cherokee County Clemson Club and now a member of the Fort Hill Clemson Club. Mike Dowling ’93 of Greenville, chief financial officer of Southern First Bancshares will serve a three-year term. He served on the Student Alumni Council and is a past-president of the Clemson University Young Alumni Council. He has also served as an Alumni National Council representative and Board of Visitors representative. Patsy Siebert DuPre ’80 of Hendersonville, N.C., will serve a three-year term. An independent contractor in Washington, D.C., she was on the board of the Washington-Baltimore Clemson Club before moving to N.C. Members of the President’s Leadership Circle, she and her husband have a son at Clemson. Heather Simmons Jones ’97, M ’12 of Columbia, founder and CEO of Opus 3, a firm specializing in economic development, human resources and labor relations, was re-elected to a two-year term. She was a charter member and officer for both the Coosawhatchie and Anderson Area Clemson clubs and is a board member of the Columbia Clemson Club. The alumni board has 23 members and is the governing body for the Alumni Association. Primary responsibilities include general oversight of programs and initiatives of the Alumni Association, financial audit and review, creation of governing policies and strategic planning. This spring, members of the Clemson Senior Platoon once again gathered on campus to celebrate their Clemson history. The first drill team ever established at Clemson, the platoon was founded in 1930 by Gator Farr as a way to reward senior cadets for three years of hard work. The group remained active from 1930 through 1960, when Clemson became a civilian school. The platoon has performed at home football games, bowl games and even once at Yankee Stadium. Through the years, the Clemson Senior Platoon has contributed more than $25 million back to Clemson, making it one of the most generous groups in the University’s history. Under the leadership of Sanford Smith ’55, the platoon still performs at events such as the First Friday Parade and Military Appreciation Day. For the fifth year in a row, alumni clubs and groups celebrated a National Week of Service. The first week of April, 20 alumni groups, from Montana to New England, joined together in community service projects that ranged from packaging, cooking or delivering meals to working with Habitat for Humanity and other nonprofits. This year, the event was coordinated with the annual University week of service, and through Clemson Sweep and the Unity Project, students participated in on- and off-campus service projects. The Enterprise Act, a bill that would allow Clemson to operate some of its non-academic functions more like a business, was passed by the S.C. Senate this spring, but didn’t make it through the House before the legislative session ended. The bill would give the University’s Board of Trustees the authority to move such functions as athletics, research and economic development into a new “enterprise division” that would be able to do such things as buy and sell property without going through the process required for state agencies. It’s needed, Clemson officials say, because the bureaucracy of state government frequently inhibits the institution’s ability to undertake projects with private business and industry in a timely manner to respond to market conditions. You can be an advocate for Clemson at the state level. For more information, or to sign up, go to clemson.edu/governmentalaffairs. From my second-floor office window in Sikes Hall, I look down every day on Bowman Field and a giant orange Tiger Paw painted on the road at the intersection of Old Greenville Highway and Calhoun Drive. You can see it, too, on a live webcam at clemson.edu. From all points on the globe, alumni send us photos of themselves holding Tiger Rags and Tiger Paw flags. The backdrop may be the Eiffel Tower, a glacier in Alaska or a fighter jet on a dusty runway in Afghanistan, but the people are always smiling. You can see these photos, too, in this and every issue of Clemson World magazine and throughout the social media world. These are the measures of a successful graphic design. The Tiger Paw is universally acknowledged as the most recognizable logo in all of college sports. It has helped define Clemson athletics and Clemson University for more than four decades. It has brought joy to thousands of alumni and fans. The paragraphs above were read aloud from a message I sent to Arlene Antonio, the wife of the late John Antonio, at his memorial service in June. John and his talented team at Henderson Advertising had created the Tiger Paw logo for Clemson. On behalf of the Clemson Family, I was proud to express our gratitude for the excellent work they did on our behalf. More literal representations of tiger mascots — even cartoon versions — come and go in style. Some are ferocious and intimidating, others are cuddly and lovable. The Paw, on the other hand, is ageless. The Clemson Tiger Paw is as fresh today as it was when it was introduced in 1970. As a designer myself, I can appreciate the skill it took to create such a successful, enduring piece of graphic art. As an alumnus and Clemson’s 14th president, however, I have come to appreciate its symbolic power. The Paw has evolved from an athletics logo into a university symbol. Why? Because the Tiger Paw managed to capture something essential about the “One Clemson” spirit. It is beloved by all and we are united, as a community, by that simple affection. It also represents not only our ferocious power, but the lasting imprint Clemson folks leave upon the world as we pass by.